Lauren Chattman presents simple and delicious recipes made from only the most wholesome ingredients. The heavenly creations include Citrus Pound Cake, Raspberry Yellow Cake Squares and Mississippi Mud Cake. Designed with the busy baker in mind, this intoxicating cookbook shows how to make long-lasting cakes in very little time. Few things are as satisfying as a sweet snack that's mouth-wateringly moist. So skip the cookie jar and head for the cake keeper. 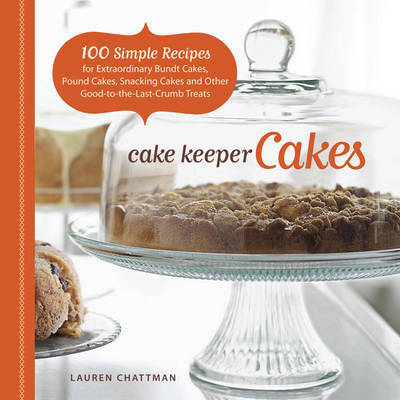 In "Cake Keeper Cakes", Lauren Chattman presents simple and delicious recipes that stand up to everyday eating. Made from only the most wholesome ingredients, the heavenly creations include Espresso-Hazelnut Bundt Cake, Banana and Bittersweet Chocolate Cake, Citrus Pound Cake, Raspberry Yellow Cake Squares and Mississippi Mud Cake. Designed with the busy baker in mind, this intoxicating cookbook shows how to make long-lasting cakes in very little time.